When it debuted back in the Bush Years, the Mercedes-Benz CLS was a shocking style icon for an otherwise-reserved company. Now we have, uh, this. 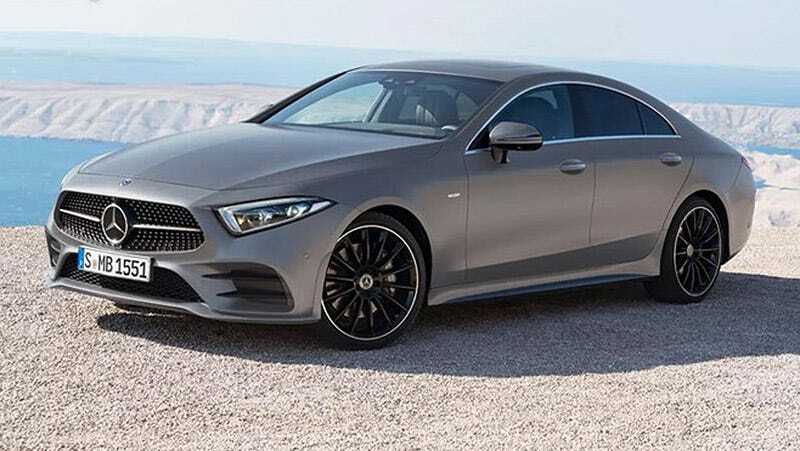 It’s the new 2019 Mercedes-Benz CLS. And while we’ve come to expect that shape by now, what’s under the hood is very special. You’re not supposed to see this car. Australia’s Motoring published their story for this car’s debut at the LA Auto Show a few days early and has since deleted it. Oh well. Wheelsmag and CarScoops saved the photos and now we can see the car in its blandness as it is. The problem with this car is it can never really live up to that unexpected first entry into the four-door-coupe niche previously only occupied by, hm, the Pontiac Grand Prix? The last one sort of had that look, I swear. In any case, the style-for-style’s-sake CLS now looks more corporate than ever, though it has angry headlights now. Apparently the CLS will now be a five-seater, but more importantly it’s getting MB’s new inline six. There’ll be the I6 in its normal twin-turbo 3.0-liter form, which should make anything from around 360 to 500 horsepower with a 48-volt hybrid assist. These figures come from Wheelsmag reporting what Motoring.com.au took down, and it’s probably wise to take them with a grain of salt. The Australian car magazine industry is notoriously optimistic. Still, that engine is gonna be wonderful, even if the car it’s in kind of looks like a sad robot.